Rookie right-hander Freddy Peralta seems to make history every time he steps on the mound for the Milwaukee Brewers barely weeks into his major league career. Fittingly enough, too, since he's about to face a Cincinnati Reds pitching staff -- mainly, reliever Michael Lorenzen -- that is doing some pretty historic things themselves. Only with their bats and not their arms. The 22-year-old Peralta is 3-0 with a 1.59 ERA in his first four major league starts, including two in which he has struck out 10 or more and allowed only one hit. He's the first pitcher in baseball's live-ball ERA to do that, and the first Brewers pitcher to have two such games in a career. How good has Peralta been? He has permitted more than two hits in only one of the four starts. In 22 2/3 innings, he has allowed only seven hits and struck out 35. Peralta is the first major league pitcher since at least 1908 to give up three hits or fewer and strike out at least five in each of his first four career games. "His stuff looks electric from center field, and you can see that in the swings and takes and called strikeouts," Brewers outfielder Christian Yelich told reporters after Peralta pitched seven shutout innings of one-hit ball to beat the Kansas City Royals 5-1 on Tuesday. "He's been great every time he goes out there, and hopefully that continues." Peralta is doing it without an overpowering fastball, like so many other young pitchers are today. He's throwing his four-seam fastball at an average velocity of 91.2 mph, or about what an average starter threw 15 years or so ago. "He's got a high spin rate and the ball just kind of jumps at you, even though it's 92 mph," Royals manager Ned Yost said. If the last-place Reds can get to Peralta on Sunday at Great American Ball Park -- and no team has yet -- they would split a four-game series in which they lost the first two games. Cincinnati bounced back from a 3-2 deficit Saturday with an eight-run seventh inning powered by a pinch-grand slam from Lorenzen off a Jacobs Barnes fastball and went on to win 12-3 for its 10th victory in 13 games. "Michael Lorenzen was pretty special," Reds interim manager Jim Riggleman said. Pinch-hit grand slams are rare enough. But by a pitcher? What's even more remarkable is Lorenzen also homered Friday night during an 8-2 Brewers victory, and he homered in his previous at-bat before that while pinch hitting against the Chicago Cubs on June 24. "I love playing baseball," Lorenzen said. "Every day, I look forward to contributing in some form." That's three homers in the last three at-bats for Lorenzen, who's quickly becoming the National League's bullpen equivalent of the Angels' multi-dimensional Shohei Ohtani. Lorenzen is 1-0 with a 1.93 ERA in 15 games, and he's 4-for-6 at the plate. He's the first pitcher with multiple pinch homers in a season since Brooks Kieschnick in 2003 -- and he has done it in only a week. 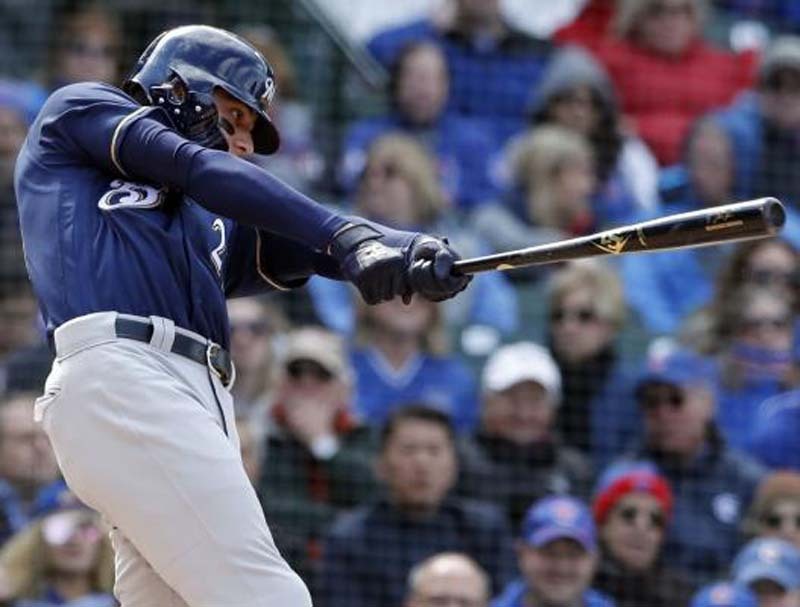 "The guy's swinging the bat really well, that's for sure," Brewers manager Craig Counsell said. "We treat him as a position player. Obviously, we've got to make some adjustments ... he's swinging it well." Then there's this: No Reds pitcher had hit a grand slam in 59 years, or since Bob Purkey in 1959, until starter Anthony DeScalfani did it June 23 against the Cubs. Now, Reds pitchers have hit grand slams twice in eight days. Lorenzen's homer was more than enough for the Reds to overcome Eric Thames' 14th home run against them in the two seasons and his fourth this season -- the first three of which were game-winners. Only two of the Reds' 15 hits Saturday were for extra bases -- Lorenzen's homer and a Scooter Gennett double -- but they were 8-for-16 with runners in scoring position. Peralta will go up against veteran right-hander Matt Harvey (3-5), who has recently given the Reds a glimpse of his former dominating self with the New York Mets. He has won each of his last two starts, giving up three runs in 12 2/3 innings, after going 0-3 in his previous four starts.